Jook box fury is the brilliant debut novel by our very good friend Kevern Stafford. Eko may have designed the the book jacket cover, the badges, and postcards, and sarahphotogirl.com, may have produced the cover photo, BUT Mr Stafford has produced the best novel about popular music you could ever wish to read. Of course we are biased, but with very good reason, heres an overview of whats in store. A chaotic jukebox song pickers’ game show takes to the road to launch the new alcopop, Jook – the drink that turns everything green for go-go. Like a cross between Seinfeld and a beat generation Top of the Pops special, JookBoxFury is a celebration of rock and pop music, and it’s epitaph. All rock ‘n’ roll is here, from its art and glories to its mythical stories. 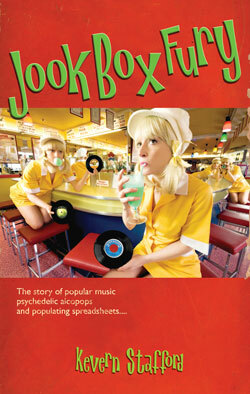 JookBoxFury – from Lonnie Donegan to Equally Humdrum. From the dawn of rock ‘n’ roll to the discovery of the nouvelle bric(01)age. Jook, baby, Jook.